Each valid entrant who has entered the competition during the Promotion Period will be entered into the draw. Each valid entrant who successfully refers another person to the competition will receive an additional one (1) bonus entry. Maximum of ten (10) bonus entries are permitted. Prizes will be drawn by random electronic draw authorised under NSW permit number LTPS/2019/32209, ACT permit number TP 19/02749 and SA permit number T19/234. 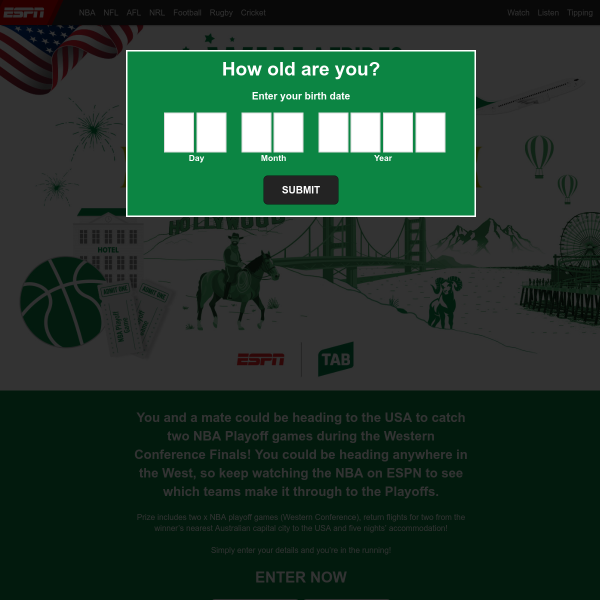 Full terms and conditions available at www.espnwin.com.au/NBAPlayoffs. Think! About your choices. Call Gambler’s Help or Gambling Help 1800 858 858 www.gamblinghelp.nsw.gov.au or www.gamblinghelponline.org.au. Don’t let the game play you. Stay in control. Gamble responsibly. Entry is open to all Australian residents aged eighteen (18) years or older. Directors, management, employees, officers and contractors (and their immediate families) of the Promoter or of the agencies or organisations associated with this Promotion, including Engage Australia Pty Ltd, are ineligible to enter. Maximum Number of Entries	Entrants can submit a maximum of eleven (11) entries, which includes bonus referral entries.